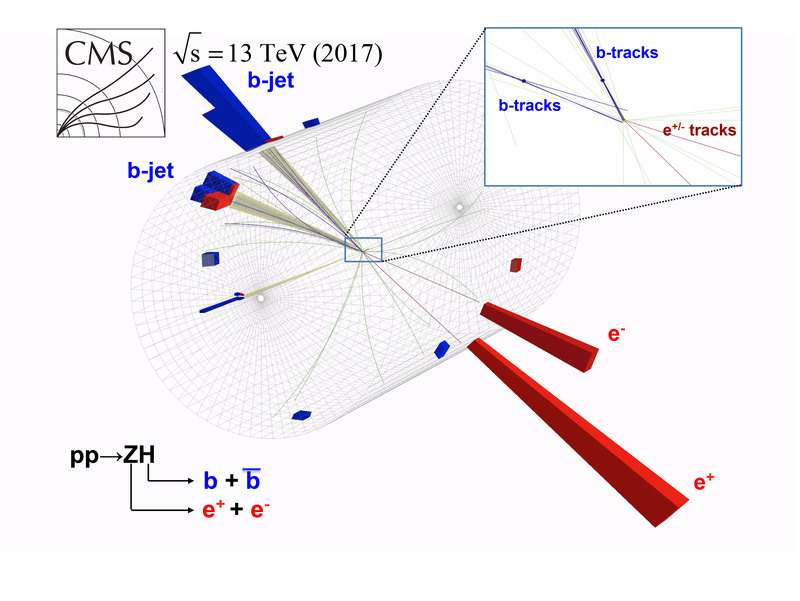 Diagram of energy and flight direction of particles detected in CMS detector for the decay of the Higgs boson to bottom quarks (b-jet). The Higgs boson has at last been observed decaying to fundamental particles known as bottom quarks. 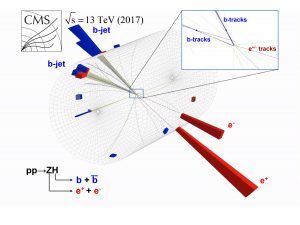 The finding, presented today at CERN by the ATLAS and CMS collaborations at the Large Hadron Collider (LHC), is consistent with the hypothesis that the all-pervading quantum field behind the Higgs boson also gives mass to the bottom quark. University of Alabama Physics and Astronomy faculty members Conor Henderson and Paulo Rumerio are members of the CMS collaboration. The Standard Model of particle physics predicts that about 60% of the time a Higgs boson will decay to a pair of bottom quarks, the second-heaviest of the six flavors of quarks. Testing this prediction is crucial because the result would either lend support to the Standard Model – which is built upon the idea that the Higgs field endows quarks and other fundamental particles with mass – or rock its foundations and point to new physics. The observed result supports the Standard Model.